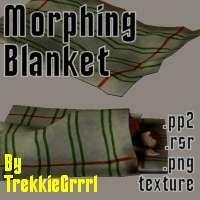 A simple blanket prop with various morphs, one of which fits a person sleeping under it. Also has a morph to make it thicker like a mattress. Sci Fi Funk (6 years ago) Inappropriate? Hi, I've used your morphing blanket a couple of times in my free web comic. It rocks. awesome, just what we were needing! Thanks! thank you very much,you know such little props ,really give the extra touch to a scene,for the people who are looking really at a render.